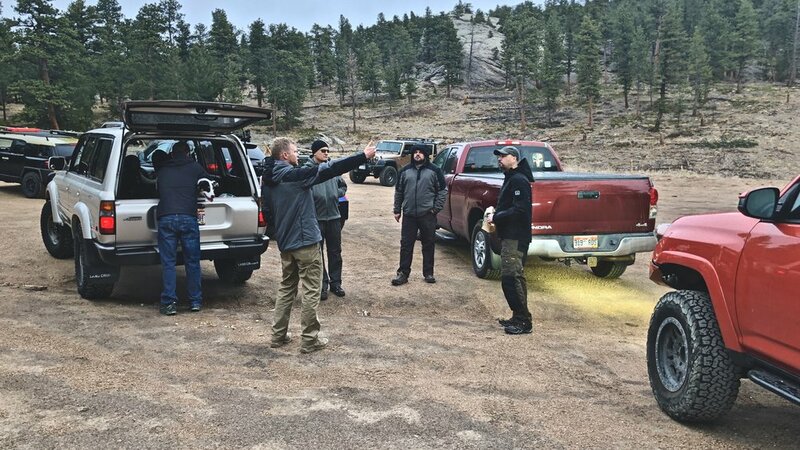 Waypoint :: Ironclads was the initial single day brand community in-field adventure event sponsored by Triple Aught Design, or TAD, in Colorado. TAD is our favorite brand here at Flatwater Overland for good reason. Not only do they produce some of the best outdoor adventure clothing in the world, but they engage with their customer base in ways no other retail company has, in my experience. To learn more about Triple Aught Design and why it is a favorite brand, GO HERE. The goal of this in-field adventure was to reach the 1965 crash site of an Air Force T-33 training jet. 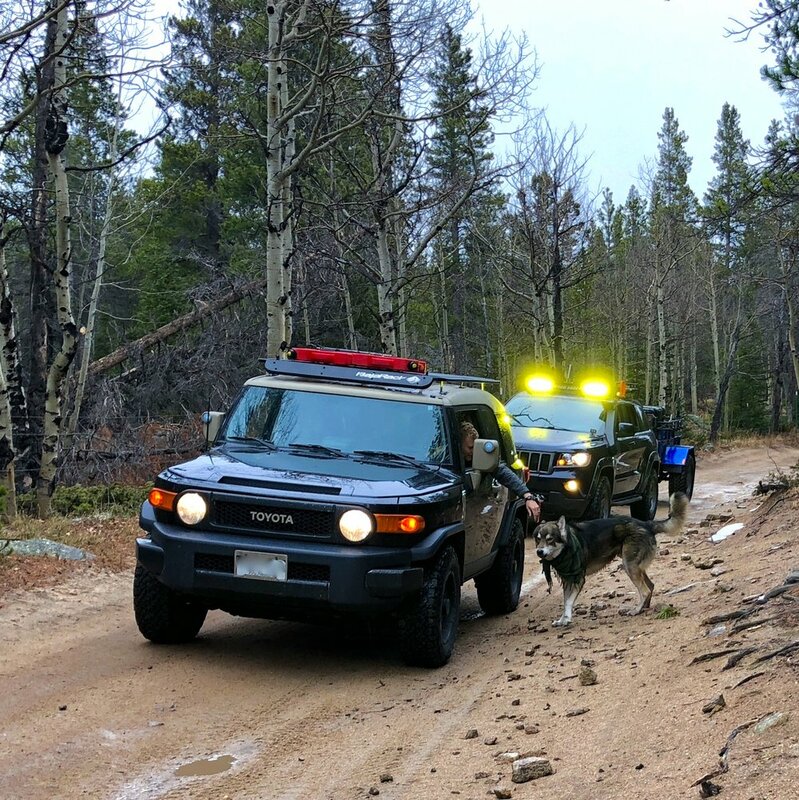 Four vehicles and 10 participants (plus three pups) met at the TAD outpost in Boulder to convoy up into the Ironclads for adventure. After a short meeting at the trailhead, the team headed into the backcountry. The sky was dark and light precipitation came down most of the day. But, there is no such thing as bad weather, only bad clothing. With plenty of TAD gear on hand, the weather only made the day more fun. Trail meeting before heading up on the mountain. Some light 4x4 driving continued to arrive at the base for a final hike to the crash site. The trails were fairly easy in the November drizzle, but the moisture convinced the crew not to tackle the final granite obstacle. The concern was coming back down the off camber granite dropoffs if the weather worsened while we were on foot to the crash site. Before heading to the crash site, the Pioneer trailer and field kitchen were deployed for a quick lunch on the mountain. The remainder of the trail past the obstacle to the crash site was a good route with a historical marker to the final stretch of hiking trail to the aircraft debris field. The T-33 wreckage was scattered over a wide area on the mountainside. The excitement of finding the goal of our adventure transformed quickly to reverence. This is, ultimately, a burial memorial. Both Air Force pilots were killed in this crash, and the location made removal of all the debris unreasonable at the time. We found fuselage and engine components, many of these metal parts permanently colored by the sudden temperature change during the crash. There was a powerful remembrance of a small flag placed in what appeared to be a piece of the wings. Although adventure was certainly discovered on this event, the real gold to be found in these mountains was the realization that even one day of some adventure in the mountains with new friends can change an individual lifestyle for the better. Plus, is there much anything better than spending time with new friends of the same heart for in-field adventure? TAD Waypoint events are meant to be accessible adventure for fans of the brand. They are free to attend, but limited to spaces to ensure safety and fulfillment of the vision. It was an honor to participate in the first Waypoint event, and looking forward to many more!